We’re not sure that we agree with Roy Wood from Wizzard who sang “I wish it could be Christmas everyday”. To be honest, we think that ‘the big day’ seems to come around fast enough as it is! It feels like no time at all since the first edition of Pro Mobile for 2015 came out, and now here we are with the last. Next stop Christmas! Of course, between now and then there’s just the matter of all those festive party gigs. In his excellent article in this issue, ‘A DJ’s Guide To The Christmas No.1’, Richard Lee reminisces about the songs, both festive and otherwise, that have taken the coveted Christmas Number 1 slot in the UK charts over the years, you’ll be surprised at how many of the tracks we consider to be staple Christmas classics didn’t manage to top the charts when they were released! 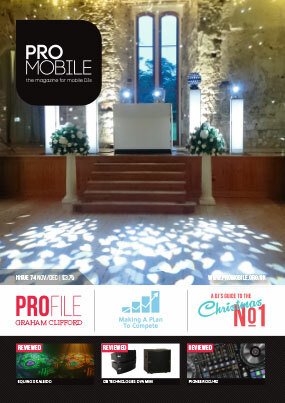 That’s just one of the many articles, features and reviews packed into the 74th edition of Pro Mobile magazine – enjoy! Veteran mobile, club and radio DJ, Graham Clifford shares his story, from youth-club discos in the early 70s to big club residencies and huge mobile shows. Richard Lee leads a journey through the decades looking at the songs that made it to the coveted Christmas no.1 slot and the festive favourites that didn't quite! Get ready for the new year with a plan to ensure that 2016 is prosperous for your DJ business. We delve into Mark Walsh's diary as he sets sail for Holland and Highlite International's dealer weekend at the company’s extraordinary HQ. Ian 'D' Smith continues the story of his 80s club DJ career, highlighting the lessons that can apply to modern mobile jocks. Ahead of his return visit to the Pro Mobile Conference in 2016, Peter Merry urges us to strive for innovation over stagnation! Richard Lee chats to international event manager Mark Tasker about his interesting career and advice for DJs. Graham Clifford Cottrell, Greg Cartwright, Ian Forest, Ian Smith, James Humphrey, John Stiernberg, Mark Walsh, Peter Merry, Richard Lee and Tony Winyard.